Gainsborough's landscapes are highly personal statements that evolved from ideas and images he developed in his studio, either directly on canvas or in scale models. In this work he focused on the physical exertions of fishermen as they confront strong winds and pounding surf. Even the massive cliff on the far side of the cove, its thrusting diagonal posed against the wind, seems to echo the efforts of the men struggling to launch their boat into the waves. Gainsborough owned works by Dutch marine painters, and their influence is evident here. His own free and suggestive painting technique, however, gives the scene a unique degree of freshness and spontaneity. He applied his paint in thin, translucent layers that are accented by deft touches of impasto, particularly in the fishermen's clothing and on the white foam of the waves. A restrained palette of browns and creams suggests the shore and rocks; gray-greens, gray-blues, and white highlights describe the sun-filled expanse of the sea, while the sky is colored with delicate hints of purple, blue, and pink. Possibly by descent to Margaret Gainsborough. Probably Augustine Greenland. (sale, Christie, Manson & Woods, London, 25-28 January 1804, 4th day, no. 43); bought by Charles Birch. Probably with (William Dermer), who sold it in 1805 to Sir John Leicester, Bt., later 1st baron de Tabley [1762-1827]; (sale, Christie, Manson & Woods, London, 7 July 1827, no. 27); bought by Smith for Sir George Richard Philips, 1st Bt. [b. 1789], Weston House, Shipston-on-Stour; bequeathed to his eldest daughter, who married Adam, 2nd earl of Camperdown, Gleneagles, Perthshire; by descent to Robert, 3rd earl of Camperdown [1841-1918], Gleneagles; (sale, Christie, Manson & Woods, London, 21 February 1919, no. 134); (M. Knoedler & Co., London); sold 1920 to Andrew W. Mellon, Pittsburgh and Washington, D.C.; gift by 1937 to his daughter, Ailsa Mellon Bruce [1901-1969], New York; bequest 1970 to NGA. The Farington Diary, \c by Joseph Farington, R.A. [1747-1821], James Grieg, ed., 8 vols., London, 1923-1928: 1153 (entry for 8 February 1799). Douglas Hall, "The Tabley House Papers," The Walpole Society, 38 (1962): 70. Possibly John Smith, the picture dealer of 137 New Bond Street, author of the catalogue raisonné of Dutch pictures. Pictures by the late William Hogarth, Richard Wilson, Thomas Gainsborough and J. Zoffani, British Institution, London, 1814, no. 30. Pictures by Italian, Spanish, Flemish, Dutch, and English Masters, British Institution, London, 1832, no. 66. Pictures by Italian, Spanish, Flemish, Dutch, French and English Masters, British Institution, London, 1863, no. 185. Thomas Gainsborough, Tate Gallery, London, 1980-1981, no. 144, repro. Gainsborough, Grand Palais, Paris, 1981, no. 67, repro. Thomas Gainsborough, Exhibit Halls, Palazzo dei Diamanti, Ferrara, 1998, no. 41, repro. Thomas Gainsborough, 1727-1788, Tate Britain, London; National Gallery of Art, Washington, D.C.; Museum of Fine Arts, Boston, 2002-2003, no. 151, repro. (shown in Washington and Boston only). The medium-coarse canvas is plain woven; it has been lined. The ground is white, probably composed partly of chalk, and smoothly applied. Infrared reflectography shows freely drawn underdrawing in parts of the picture, such as the cliff on the left. The painting is executed in broad brushwork, blended wet into wet, using glazes and scumbles, with slightly impasted white highlights. X-radiographs taken of the area including the figures do not reveal any pentimenti, but conservation in 1985 demonstrated that the foreground had been completely repainted to hide crackle; removal of the repaint revealed, beneath the thinly painted rocks on the right, two figures seated facing each other, the one on the left with his left arm upraised as if throwing a net. At the same time many of the more disturbing wider cracks, both the left and right sides approximately one inch in from the edges, and a number of areas of abrasion in the sky, were retouched. The heavily discolored varnish was removed in 1985 and replaced with a synthetic varnish. Farington Diary (8 February 1799), 4:1153, possibly the Washington, picture. Morning Post, 6 August 1814. [Carey, William]. A Catalogue of Pictures, by British Artists, in the Collection of Sir John Leicester, Bart. London, 1819: 4, no. 3. Also London, 1819 [descriptive ed. ]: 10-13. Young, John. A Catalogue of Pictures by British Artists, in the Collection of Sir John Fleming Leicester, Bart. London, 1821: 18, no. 40, etched repro. opp. Fulcher, George Williams. Life of Thomas Gainsborough, R.A. 2d rev. ed. London, 1856: 143-145, 198. Armstrong, Sir Walter. Gainsborough & His Place in English Art. London, 1898: 160; popular ed., London, 1904: 214. Waterhouse, Sir Ellis. Gainsborough. London, 1958: 31, no. 954, pl. 224. Hall, Douglas. "The Tabley House Papers." Walpole Society 38 (1962): 70, 114, probably the Washington picture. European Paintings: An Illustrated Summary Catalogue. 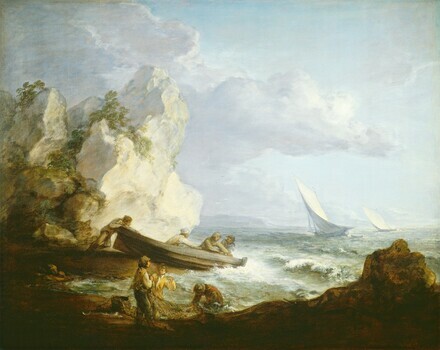 National Gallery of Art, Washington, 1975: 144, repro., as Seascape. Walker, John. National Gallery of Art, Washington. New York, 1975: no. 501, color repro. Hayes, John. The Landscape Paintings of Thomas Gainsborough. 2 vols. London and New York, 1982: 1:139, 164, color pl. 11; 2:493, no. 129, repro. Walker, John. National Gallery of Art, Washington. Rev. ed. New York, 1984: 357, no. 499, color repro., as Seascape. European Paintings: An Illustrated Catalogue. National Gallery of Art, Washington, 1985: 167, repro. Hayes, John. British Paintings of the Sixteenth through Nineteenth Centuries. The Collections of the National Gallery of Art Systematic Catalogue. Washington, D.C., 1992: 92-95, color repro. 93. National Gallery of Art, Washington. National Gallery of Art, Washington, 1992: 150, repro.